Every weekend is a moment of pause for the General Congregation, with interesting proposals of visiting the city. It is in this context that I had the joy of discovering the crypt that is found under the Church of the Gesù. In these days when we remember the deceased, it is customary to open the crypt to the public for prayer. This Saturday several of us benefited from the commentary of Fr. Michele LAVRA, who had us visit this place and who introduced us to the history of the location of the House of the Professed of the Society in Rome in the time of St. Ignatius. 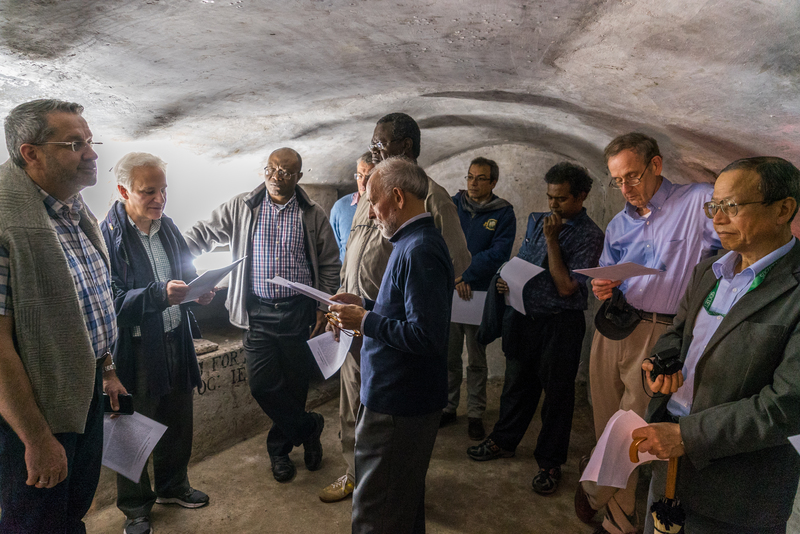 The crypt holds the remains of 18 Fathers General, if we count the body of St. Ignatius, and those of Fathers Pignatelli, Roothaan, Arrupe, which are kept in the church proper. We also find the tombs of several other Jesuits from the 19th century. An experience of the catacombs of the Society! It is moving to see these companions buried in staggered locations as before in the ancient catacombs. A properly Roman way to bury. We particularly remembered the figure of Father Lorenzo Ricci (1758-1775), who experienced the suppression of the Society in 1773, and who died imprisoned in Castel Sant’Angelo. This was an opportunity to commemorate these dark times experienced by the Society. After remembering him with an Our Father, I was moved: “Forgive us our trespasses as we forgive those who trespass against us.” At his election he warned the Society against arrogance and against the tendency to self-celebration. And as he died, he affirmed the Society’s innocence before God. His obedience and love of the Church continue to impress me. To my surprise, on all the tombs of the Jesuits of the new Society (after 1814), we see written: professo di 4 voti or coad. spile. and even profes. di tre voti. It is a strange custom in memory of the deceased Jesuits, which inevitably touches on a sensitive subject for living Jesuits. But let us maintain our composure … the crypt will soon be sealed and the subject will return to its decidedly deep, underground calling! Understand it who may!